Lammersen, F., Solheim, E. 2015. Aid for Trade Works. GREAT Insights Magazine, Volume 4, Issue 6. December 2015/January 2016. The 10th Ministerial Conference of the World Trade Organization (WTO) offers an opportune moment to take stock of the substantial achievements of the Aid for Trade Initiative, which has been largely successful, and reflect on how to continue its relevance in the context of the Sustainable Development Goals. Openness to trade and investment is a key ingredient for generating economic growth and raising living standards. Regional and Global Value Chains (GVCs) have become an increasingly prominent feature of world trade and investment. By providing access to regional and global markets, capital, knowledge and technology, integration into a value chain can offer a path towards economic development that is easier to follow for developing country firms than building a fully vertically integrated value chain. GVC participation among developing countries is growing since early 2000s. Among developing regions, South East Asian economies and those in Europe and Central Asia show the highest participation rates with countries in the Middle East and North Africa also showing relatively high ratios. In contrast, Latin America, South Asia and Sub-Saharan Africa still trail behind although their participation grew by 26%, 34% and 28% respectively between 2001 and 2011. Despite these positive trends, developed countries still exhibit, on average, higher participation rates with European countries leading the way (see Figure 1). 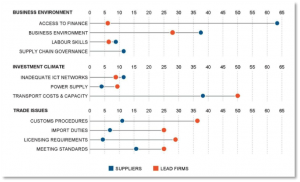 Developing countries can help their firms integrate into value chains by opening their markets to trade and foreign direct investment, improving their business and investment environment and strengthening their domestic supply-side capabilities. Many developing countries, however, still price their companies out of business because of inefficient border procedures, high tariffs and non-tariff barriers that unnecessarily constrain trade in goods and services. Other things that also may raise prices are restrictions on the flow of information, impediments to foreign direct investment and limits on the movement of people. The challenge these economies face is to design and implement broad strategies that tackle these key barriers to integration and upgrading in value chains. Transport costs are ranked as a big obstacle by the privates sector. 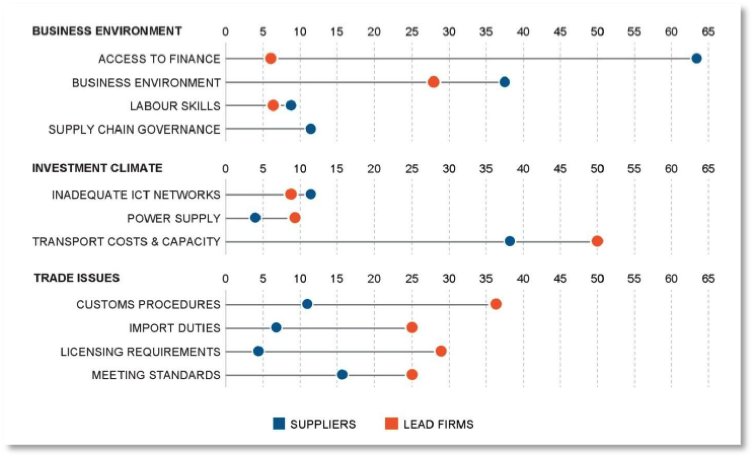 Suppliers from developing countries rated access to finance (and in particular, trade finance) as the main obstacle preventing them entering, establishing or moving up value chains. They also cited the business environment and regulatory uncertainty as major obstacles, together with a lack of skills in the labour force. Other prominent concerns included regulatory uncertainty and standards compliance issues, while informal practices and payment requests were cited as a particular concern for GVCs (see Figure 2). A total of US$ 246.5 billion in official development assistance (ODA) has been disbursed by bilateral and multilateral donors for financing trade-related programmes and projects, since the Aid for Trade Initiative was launched in 2006. 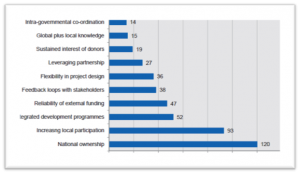 Programmes aimed at reducing the infrastructure gap in developing countries and programmes targeted at building productive capacities received almost all of the money, while a smaller part supports capacity building programmes in trade policy and regulation. To date, more than three quarters of total aid for trade has financed projects in four sectors: transport and storage energy generation and supply agriculture and banking and financial services (see Figure 3). In addition, a total of US$ 190.8 billion in gross trade-related other official flows (OOF) has also been disbursed since 2006. 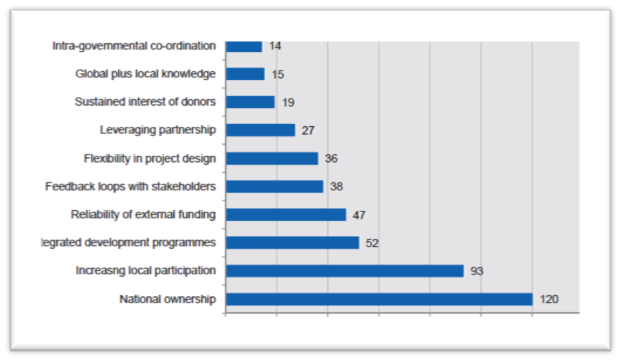 Most of this non-concessional funding supported projects in economic infrastructure (47%) and building productive capacities (52%) and almost exclusively in middle-income countries (92%). One dollar invested in aid for trade generates nearly eight additional dollars of exports from all developing countries – and twenty dollars for the poorest countries, OECD research found (OECD/WTO, 2013a). Results, may vary considerably depending on the type of aid-for-trade intervention, the sector at which the support is directed, the income level, and the geographic region of the recipient country. Aid-for-trade case stories buttress this evidence. The sheer quantity of activities described in these case stories suggests that aid for trade is becoming central to development strategies and has taken root across a wide spectrum of countries and activities. Although not always easy to attribute cause and effect, the stories show tangible evidence of how aid for trade is helping countries build the human, institutional and infrastructural capacities for turning trade opportunities into trade flow and helping men and women earn a decent living. The case stories mention 299 results. The most important ones are export market diversification, an increase in employment, including for women, and an increase in foreign and domestic investment. These results are closely followed by a rise in per capita income and poverty reduction (see Figure 4). The findings are rather similar to those reported in the 2011 exercise. However, any conclusion from the collection of case stories must be tempered by the awareness of its selection biases (OECD/WTO, 2013b). 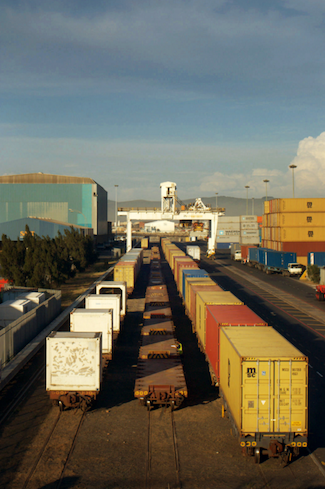 The Aid for Trade Initiative has achieved much since its inception in 2006. The delivery of aid for trade has been largely effective, but more could be done especially through regional approaches, while experimenting with new forms of aid delivery could strengthen accountability between donors and partners and help with improving results. It is also clear that there is still considerable scope to enhance the international division of labour by further integrating countries that have heretofore remained marginally engaged in trade in general and in regional and global value chains in particular. The Initiative should focus on the fundamental changes that are taking place in the trade and development landscape. In response to the changing nature of the world economy and its rising complexity, new analytical approaches are needed to better understand the trade-offs and complementarities between policy objectives – e.g. between growth promoting policies and equity and environmental concerns. Addressing these concerns and dealing with these interlinkages requires integrated approaches that breakdown silos between policy communities. The Aid for Trade Initiative should be an integral part of this new approach to policy which is essential if we want to deliver the Sustainable Development Goals by 2030. The 10th WTO Ministerial Conference in Kenya offers an opportune moment to take stock of the achievements of the Aid for Trade Initiative and reflect on how to continue its relevance in the changing trade and development landscape. This article is based on a longer paper, Lammersen, F. 2015. Aid for Trade 10 Years On: Keeping it effective. OECD / WTO. Frans Lammersen is Principal Administrator, OECD Development Cooperation Directorate. 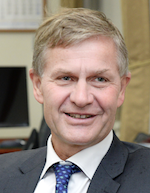 Erik Solheim is Chairman, OECD Development Cooperation Directorate. OECD/WTO (2013a) Aid for Trade at a Glance: Connecting to Value Chains. OECD/WTO (2013b) Aid for Trade in Action. OECD/WTO (2015) Aid for Trade at a Glance: Reducing Trade Costs.